An exciting day in the life of a rookie lawman. He has never had to fire his weapon, respects his superiors, and is always ready for any emergency ­ day or night. TRT: 4 min 30 sec., © 2001. 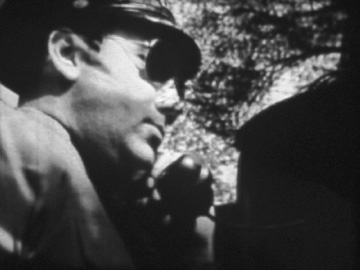 Screening format: 16mm, Color, Sound. Preview Format: VHS, DV. Digital Images Available on Request. An exciting short bus trip in San Francisco, CA as told through an animated photo/flip book in the tradition of Biograph's 1890 film toy, the Mutoscope. 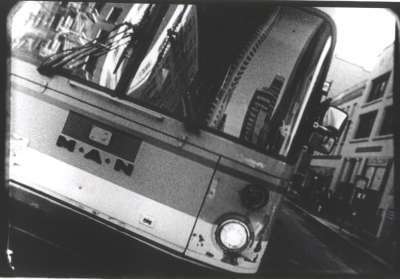 This sixty second film flip-book consists of a series of flipping photographs which are thematically linked through transportation and individuals moving through the world. La Reina De Los Sueños Mujer admira, Mujer iluminada La Reina is an experimental film about the miraculous visitation of the Virgen de Guadalupe in 1531. It is about the very moment when she appeared to a Native American on his way to Mexico City, when the air was filled with sound of birds singing and flutes playing as she mysteriously appears surrounded by fire. In childhood we see the world as a mystical universe continually reshaping itself. The miraculous is part of the everyday until we are taught to separate the real from the imaginary. When we split the two, we unlearn the secret language that speaks to us in dreams. In dreams the images come like waves to the beach. Los sueños (the dreams) that come with our eyes wide open are the reminders of how close we are to the mytstical world and how we chose to block it out of the everyday. Those visions/visitations are the windows to our hearts. At the deepest levels the image of the Virgen de Guadalupe becomes the one of the focal points through which we are shown the humanity of each other. These things must always be re-learned. Quxiote Dreams is a surreal exploration of the Quixote myth, a traveling matte fantasy in which an exhausted Don Quixote collapses into a cinematic dream world in which he discovers the futility of blind faith and emerges rehumanized. Drawing from Sartre's play No Exit; No Outlet draws from scenes of violence and their original setting to show the absurdity of cinematic violence and its Mobius strip nature of being forever trapped in a brutal cinamatic world. Memory Eye examines the process of remembering: flickering images emerging from childhood glimpses of an old photo, a familiar sound or smell. This is a filmic exploration of the places where memory is held and the importance of how we remember those ellusively shifting images. The main body of the film was shot on VHS, video 8 and super 8mm, then re-photographed and optical printed as many as 6 to 8 times, creating a stylized, flickering multilayer of color and black and white imagery reminiscent of dreamy childhood memory. Film For... is a collage of camera original footage, educational film and other amusing snippets of found footage, interlocked with dialogues and statements (some from the found footage itself), documenting gender politics and the lack of substantial change inspite of our perceptions to the contrary. Email Alfonso Alvarez at alvamel@earthlink.net.